/Content Marketing /How to get more traffic from search engines? Let Google tell you. Chances are high that you found this article using any keyword in a search engine like Google and you hope to find a way to improve the traffic coming to your website. Let me introduce you to one method how to achieve your goal. In this article I am going to reveal my most important strategy when building a content website that gets traffic from Google or other search engines. The implementation is not easy, but it works very well, will help you to build a website with quality content that meets the expectations of potential visitors. It is basically something I am not only doing myself for some time, but also regularely advise to friends and colleagues in the business. I wrote this article for everyone who wants to get more traffic from search engines to their website. You can just start to build a new project or already work on some for years. A lot of bloggers who write about content marketing mention this method from time to time, but I didn’t find a more detailed guide about it anywhere. There might be many reasons why you want more traffic on your website. Either you are selling something, you earn some money with affiliate links or AdSense or just like to publish great content to a lot of people. This will work for all of you. The aim of this method, that I don’t even have a name for, is to help you get more visitors from search engines. That is the short version. The long version is getting more quality traffic from search engines with great content that attracts and interestes potential visitors. Quality traffic means visitors, who find what you can offer on your website. They are more eager to read, share, buy or do anything but just leaving your website right away. It is not only about quality traffic, but more about quality content. The method I am going to describe will hopefully help you to get more quality content on your website. This is the tough part, but I am coming to it later. In a few lines I am going to explain my free and relatively easy method how to get more visitors to your website, but just wanted to write a short disclaimer. I am concentrating only on traffic from search engines. This is great and doesn’t need additional marketing expenses, but also makes you more vulnerable. Search engines like Google are very important, but you should try to drive traffic from other sources as well. Build followers, e-mail lists or have a facebook fan page as well. When I start new websites or projects using content marketing (like I do with webgilde.com), I think about the first few articles in advance. Before writing them, I do a quick keyword research with Google AdWords Keyword-Tool. The keywords tool helps you to find out how many searches are monthly done in Google’s search engines for the keywords you entered. This is pretty nice to estimate the traffic a specific keyword might bring to you from search engines. I am not going into this tool now, but you should know it, period. After I wrote the first draft of this article, Google AdWords Keyword Tool was still online. In the meantime, Google introduced their new Keyword Planner that is going to replace the Keyword Tool. As a result from my first tests I would say, there is no problem in using Google Keyword Planner for the purpose of this article. For this article, I head over to the keyword tool and entered a lot of keywords I thought might fit the content and the keywords people might enter into Google to find these information. As you can see from the screenshot below, I tried some variations from get more traffic to get more visits. I did try a lot more, but you get the idea. The result that I got was more than clear. Get more traffic is a great keyword to go. It is long tail (meaning, longer than one or two words), drives some traffic that is not to low, but also not to high to have too much competition and I don’t see an obstacle to reach out to people who are not interested in what I have to tell them, or are you disappointed? Please leave a comment if I misread your intention. For new projects, you can enter whatever you think people with interest in your content might search for and go for the best keywords you find. As you will see later, this will narrow down with more content on your website. webgilde.com is still a new project and there wasn’t content on something related to this article, so I tried something new. What comes now is the creation of the content. That is the magic you are responsible for. What helps me a lot is to be passionate about the things I write about. That why I am currently only writing one article per month on this blog. One month is enough time to find a topic, experiment and publish the results. Since I am only writing about things I like, I know and I have tested, I am not able to write more often. There wouldn’t be time to actually do these things if I would be caught up in writing. And I would probably also lose the fun in it. Life is like a box of chocolate – you never know what you’re gonna get. Well, it is similar with your content. The keyword you optimize for when writing might not be the keyword you rank for. Optimizing for a keyword is just a way to tip Google bots nose into it, but he will decide how it smells. That is the reason I don’t over optimize when starting with new content. Google keyword tool is telling you the general search volume for a keyword, but you can’t predict how your website is going to rank for it. This doesn’t mean you shouldn’t optimize for keywords, at least not for the first article. With a bit practice you will get a feeling for it. There are two very important tools you need when starting your website. These are Google Analytics and Google Webmaster Tools. Both are for website statistics and monitoring, free to use, but need you to create a Google account, if you don’t already have one. For the purpose of this article and your first steps Google Webmaster Tools might be enough to go. But you would probably need a web statistic tool anyway, so you might already integrate Google Analytics. To use Analytics, you need to include the tracking code into your website. You might also want to connect Google Webmaster Tools with Google Analtics. If you do so, you will benefit from cross referencing the data or use filters on the keywords. This has some benefits if you rank for more than a couple of keywords. For all this there are plenty of manuals on the internet, so I am not going deeper into how to do that. After you published your great content and your website is already indexed by Google, you will get more or less traffic from search engines. If nothing at all, my first guess would be a technical problem, like preventing Google from indexing your site. I am sure, great content still ranks without doing backlinks. You might also wait for a couple of weeks to give Google more time to set your ranking. Use this time to write more great articles. Once your content was online for a while you might want to visit the Webmaster Tools. If you click on your website you will see the Dashboard with a graph called Search Queries. These are the queries or keywords you rank for in Google. “Rank for” doesn’t mean you get visits from them, but it is already quite close. Your graph might look like the one below that I took from webgilde.com. The blue line indicates the Impressions, meaning how many times one of the urls from webgilde.com was displayed among the search results. As you can see, the number increases slowly, but steadily even though I publish just one article a month for only half a year now. Now, the real value lies beneath the graph. There is a list ordered by Impressions telling you how many times Google showed your website to someone who entered the keywords. In my case, there are above 200 keywords in total with the keywords google dfp and 400 impressions on the first place. Until today, I published 8 articles and a couple of pages here on this site, so it is obvious I didn’t optimize for all of these keywords knowingly. I used a screenshot of the keywords with the most impressions as the featured image for this article above. As you can see, I even rank for adsense. This comes totally surprising to me, because I didn’t intentionally optimize for this keyword. I supposed adsense to be a really tough one. Anyway, impressions don’t mean clicks and there aren’t any and I am not even on the first page. Maybe there are many people scimming through more than the first 10 results. With the third dfp it is the same. The fourth query adblock firefox already emphasizes what I wanted to show you here. I did write about AdBlock users, and I am very happy to rank for some of the best keywords for this, but adblock firefox doesn’t meet my intention. I can tell you, between the first 10 results, there are three queries with adblock + any browser. Looking at the adblock results shows me that I either did something wrong when choosing the keywords or there are just a lot of other interests Google matches with my articles like the one about adblock statistics. One of the few keywords I find matching the content I offered is the one I used in the last sentence to link to the article: adblock statistics. I just found it among the other unrelated keywords and used it intentionally first time now. The majority of the other queries are obviously from users who are searching for an ad filter for their browser. Since I am offering background information on adblock users and even a tool for webmasters to count adblock users, these queries don’t match my offer and it also would be a waste of time to attract them. Using Google Analytics, you might want to visit Traffic Sources > Overview > Search Engine Optimization > Queries. I don’t know why these numbers vary from the numbers in Google Webmaster tools and which are more accurate, but they ought to be the same. Anyway, here you have the whole advantage of the Analytics tool box like searching for a keyword, filters or different views. You should play a little with the search. For example, I entered in “ad. *block” to get results with adblock as well as with ad block. OK, you now know how to find the keywords you already rank for. The Webmaster Tools even list the number of clicks you get and on which position you are listed in average. I take this list of keywords as an inspiration for new content, because it shows me not only what people are looking for, but also how Google assessed it to match the query. So, despite a higher number of unspecific or uninteresting keywords, I see chances and opportunities. My aim is now to find keywords that I could push to get ranked even higher. In my case I might optimize for google dfp. This might happen by writing a complete new article or optimizing the existing pages for it. The last point from the list is the most complex and needs some more explaining. You should always go for keywords that have the most impressions with rather bad positions. On some of my bigger projects I have long tail keywords with over 10,000 impressions that I didn’t optimized for. So, what might happen if I did? I would call this keyword a hidden champion. This is something even competitors might never enter into the Keywords Tools, because it is so generic. Even if your keyword list is still short it might help you to determine your next topics. 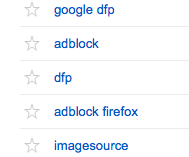 In my case I really think about more adblock statistics, but also the google dfp topic is very hot. That is something I know about and would also love to test and write about more. Knowing the searches and possible traffic this might bring, is even a better motivation. You might also use the keywords to optimize existing content. I definitely have to check some wording or whether to say adblock or ad block. As I mentioned, you should also look for other traffic sources than Google. But the keyword list is a great tool and when analyzed honestly, can tell you what your potential readers are looking for. Help them! With every new article, the list will grow and become a more powerful instrument to get more traffic. And since this is about offering great and helpful content, the Google updates many SEOs are afraid of won’t hit you. When you think about what to write next, let Google tell you. They already know what you are good at and what others are searching for. This still needs you to write great content, do your SEO homework and connect with your readers, but is easy to implement into your workflow. this post is not about turning away from Google. One might even discuss it is making you even more dependend on Google. But great content is always positive. Great article and learned a lot from it. of course I am constantly reviewing keywords and optimize from time to time. I use some free and paid tools for that. A lot of tools give you different results so finally you also need a bit of luck and trust in your guts. Suppose I’m producing 1 good article everyday. How long will it take to get traffic from google. Because it has bee 1.5 months since I started blogging and I’ve got only 3 views from google search queries…All of the articles are SEO green light using Yoast plugin. can you find your own articles on Google using the keywords you optimized them for? Is your blog visible to search engines (see WordPress Dashboard Settings > Reading > Search Engine Visibility)? I recently launched my new website based on NFC technology. It has been more than a month now with 10-15 quality articles. But when I checked my webmaster dashboard, I found out that I was not getting ranked for any of my keyword. Can you please tell me how much time does it take for google to send some real good traffic to new website. I had asked the same qs to many bloggers and they told me couple weeks is enough time. I hope you can explain this well. Hi, not getting any impressions at all is rather odd. Sometimes it just takes days, sometimes weeks. Do you get any messages from Webmaster tools that your site can’t be indexed? Hi, this is great post but I have over 200 blogpost on my site then i get only 400-500 visits per day Why? Hi, content itself is no guarantee for traffic. Good points for Traffic from search engines ..I am still facing problems with the approval from Websites traffic from search engines. Great sharing information in blog. Amazing article, this is pretyy much what I do. People simply don’t stick around long enough to use this data. They quit right before there blog begins to gain traction. Yes, I completely agree. Planning for a longer term is one of the most important lessons that I learned in the last years. It is a long term method and can take time. However, if done correctly, it can provide sustainable traffic. I started my website on Feb 2016 , now my website going very fine , and also i got the google adsense approval. But i didnot get more search visit from google search , can you suggest me the best keyword for my website http://www.techinfoworld.com , its possible for you. Hi, I can unfortunately not suggest you a specific keyword directly. This is what the article tries to help you to figure out yourself. Very well written. At the initial I was blank about how to get traffic from search engines. Thanks for your article , I have got an idea about getting the traffic. How should I write my content? Too long or medium or short. I have been there in blogging for two months and have not got traffic from search engines. The problem which I`m facing is google ranking. How should I increase my google rank? Could you help me in this, if possible. I would focus on texts between 500 and 1000 words for the beginning and continue for at least 3 month. Then evaluate your situation also based on the information in this article.